Speech by H.E. 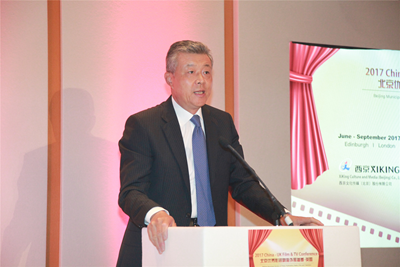 Ambassador Liu Xiaoming at the London Ceremony of 2017 China-UK Film and TV Conference: Creativity Will Boost China-UK Ties in the "Golden Era"
A few hours ago, the UK just observed a minute's silence across the country. I would like to begin by calling on everyone to join me in expressing our deepest condolences on the victims who lost their lives in the terrorist attacks three days ago in London and extending our sincere sympathy to their families and those injured. On behalf of the Chinese Government and Chinese leaders, I have told my British colleagues that at this time of difficulties, the Chinese people stand firmly with the British people. Now, please allow me to extend warm welcome to Chairman Li Wei and his delegation. I also want to express warm congratulation on the opening of the 2017 China-UK Film and TV Conference. In the coming three months, films and TV series from Beijing will bring to the British summer season a wonderful feast of Chinese culture. This will give the British audience a taste of the long history and rich culture of the Chinese civilization. It will also take viewers on a journey to experience the rapid changes taking place in China today. First, film and TV exchanges between China and Britain have become a new highlight of China-UK cooperation. In film and TV making, the UK has been a pioneer and a world leader. As early as 1894, London opened its own kinetoscope parlour. British engineer John Baird invented the world's first television. Today, British film and television industry has a GVA of 10 billion pounds and an annual export of nearly five billion. It has become the best British brand in the world. Films and television dramas, such as the James Bond series and Downton Abbey, are international blockbusters. They have a large number of fans in China as well. Compared to the UK, China is a latecomer. But in recent years China is catching up quickly and becoming a leading producer of films and TV series. In 2016, China's radio broadcasting, film and television sector is valued at 80 billion US dollars. There are over 14,000 radio and television producing and operating companies. In films, there are nearly 8,000 cinemas in China, with 1,612 new ones added last year alone. That means an average of four or more cinemas added per day. There are now more than 40,000 screens in China. The number of increase last year was 9,552, which means 26 new screens were added each day. Beijing is a leader in China's film-television industry in terms of total output, production standard, infrastructure and market. If London and Beijing could join hands and forge closer cooperation in this field, there is a huge potential to be tapped and broad prospects to be embraced. Second, the rich cultural resources of China and Britain could be leveraged to step up the development of our creative industries. Both China and Britain have a rich culture heritage. Both are cultural giants. Our respective strengths in the creative industries have much to offer to each other and our cooperation has a solid foundation. Britain is the first to put forward the concept of creative industries. Now creative industries have become the second largest sector in this country only after the financial industry. Recent years have seen the combination of British strengths in creation, production, professional training and international marketing with the creative sector boom, strong financing capability and huge market potential in China. The match up of these strengths has yielded fruitful outcomes. In 2014 and 2016, China and Britain signed film and television co-production treaties respectively. The UK is the first major western country to sign both treaties with China. Last year, China and Britain co-produced six films. I would say that our cooperation on film and television has become a new growth point in our cooperation on creative industries. President Xi Jinping said, during his state visit to the UK in 2015, that China and Britain should enhance exchanges and mutual learning in the field of creative industries. Jointly made cultural products could help increase mutual understanding and enable common development. In December last year, our two countries co-hosted the China-UK Creative Industries Forum during the fourth meeting of China-UK High Level People to People Dialogue. That Forum brought together around 150 industry representatives from both countries and witnessed the signing of several cooperation agreements. That was a solid step toward closer cooperation on creative industries between China and the UK. Third, enhanced cultural exchanges build a new bridge of communication. Exchange and mutual learning between different civilizations have always been a strong driving force of human progress. This is also key to building a solid foundation for enduring China-UK relations. 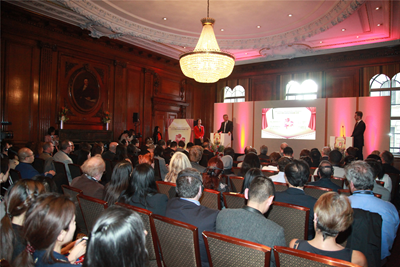 In 2015, China and Britain successfully co-hosted the Year of Culture Exchange. Last year, we jointly commemorated the 400th anniversary of the passing of Tang Xianzu and William Shakespeare. The commemorative events helped bring our two nations closer together. In the coming years, China and Britain will co-host a number of exhibitions. These include an exhibition by the National Maritime Museum in 2020 that aims to explain to viewers the significance of China's Belt and Road Initiative. We are living in a time of new media. It calls upon us to adopt new forms and open new channels of inter-civilizational exchanges and mutual learning. Clearly, enhancing exchange and cooperation in the field of film and television will create a new platform and build a new bridge for the cultural exchange between our two countries. They can play a significant role in deepening the mutual understanding and friendship between China and Britain. China-UK relationship is now at its best time in history, as evidenced by the ever-vibrant cooperation in all fields. The creative industries, the film and TV industry in particular, are fast becoming a new growth point in China-UK cooperation. This China-UK Film and TV Conference is one of the best examples. We need to work harder to promote further cooperation. I would like to make three suggestions in this regard. First, we should seize the historic opportunities. The opportunities are in the "Golden Era" and the Belt and Road Initiative, and they are up for grabs. We should enhance exchange between our creative industries. We should increase mutual understanding between our people and build up public support for China-UK relations. We should dare to blaze new trails. We should explore to find common interests. These efforts will contribute to the growth of our overall relations. Second, we should improve the mechanisms of cooperation and build new platforms. China-UK cooperation cannot progress without sound cooperation mechanism and framework. In recent years, China and the UK have had proactive interactions in film and TV, fashion, design, performing art and publication. These interactions have led to deeper cooperation. Of all these, cooperation in the film and TV industries have played a leading role. I hope other creative fields will follow suit by strengthening the mechanism, building the platform and laying a solid groundwork for cooperation. Third, we should match up our strengths for win-win results. In recent years, different regions in China and Britain have been working together to leverage their respective strengths and boost the exchange between our creative industries. This has effectively contributed to the overall cooperation between our two countries. Beijing is an outstanding example. Going forward, we should work together to incorporate such efforts into our respective national and regional development strategies. This will help advance the cooperation between our creative industries and bring China-UK practical cooperation to a new high. Film and TV are arts of time and space. They are the youngest member in the family of art. It is my sincere hope that China-UK cooperation on film and TV will defy the distance of time and space. I look forward to more innovative efforts and new success in the cooperation between Chinese and British creative industries. And I am sure such efforts and success will contribute more creativity and dynamism to the "Golden Era" of China-UK relations. 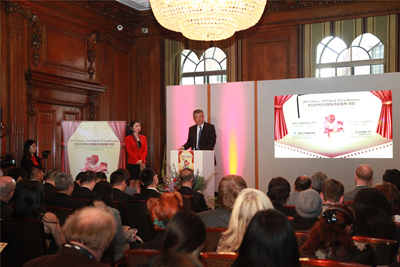 In conclusion, I wish the London Ceremony of 2017 China-UK Film and TV Conference a complete success!